Description: Aphid adults have pear-shaped bodies. They, generally, are less than 1/8 inch long. Their color varies according to species, but common aphids are green, yellow or black. The most distinguishing feature is two short cornicles, or tubes, which extend from the end of an aphid's body. These structures are partly responsible for secretions of a fluid thought to be useful as a defense mechanism. Aphids can cause deformation, wilting and defoliation of new growth of blueberry plants. Heavy aphid infestations can reduce fruiting bud formation for the following year’s crop. Aphids produce copious amounts of a waste product called honeydew. Honeydew is a sugary secretion that can cause outbreaks of sooty molds on foliage and fruit. Sooty mold can inhibit photosynthetic ability of plants by blocking sunlight. Aphids can transmit blueberry scorch virus. 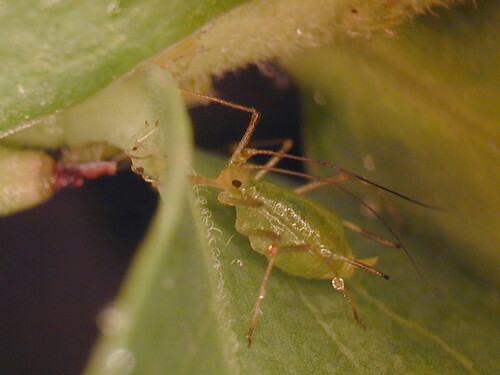 Aphids have piercing-sucking mouthparts and cause damage by sucking the plant juices. Aphids commonly are found on the stems, undersides of leaves and on flower buds. Aphids feeding causes leaves to curl or crinkle and flower buds may become hardened, causing the flowers to become distorted. Aphids excrete large amounts of honeydew, which is a sugary liquid made up of unused plant sap and waste products. This provides an excellent medium for the growth of a black fungus called, "sooty mold". This mold interferes with photosynthesis and retards growth of the plant. Sooty mold usually goes away following control of the insect infestation. Large populations of aphids can cause curling, yellowing and distortion of leaves and stunting of shoots. Some aphid species inject a toxin into plants, which further distorts growth. A few species cause gall formations, or leaf swelling. Examine the terminal stems and the undersides of leaves one to two times per week during the growing season. Tiny white cast skins deposited on the upper leaf surface is usually the first sign of an infestation. Check for ants. Ants feed on the honeydew excreted by aphids. If ants are detected on plants, check closely for aphids. Use slow release nitrogen fertilizer sources such as ammonium or urea-based formulas to avoid rapid and excessive flushes of new growth. Insecticidal soaps and oils should be considered when a pesticide is required. These soaps and oils are effective against aphids and are the least toxic to people and the environment. Isaacs, Rufus. Aphids. Retrieved 06 July 2010..
UC IPM Online. Aphids. Statewide Integrated Pest Management Program. University of California. WSU Whatcom County Extension. Aphid: Insects and Invertebrates. Washington State University.